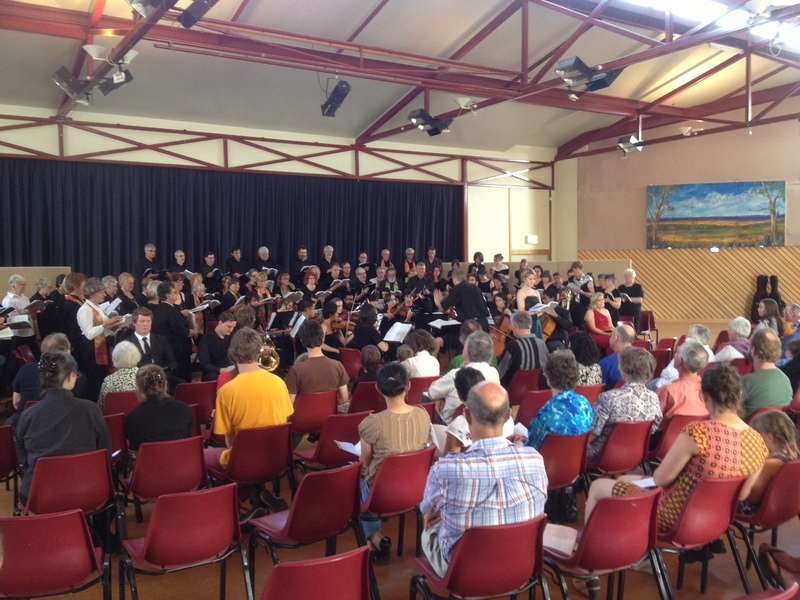 Last Saturday, buy information pills Cooma’s Multifunction Centre was the venue for Cooma’s very own Sing Your Own Handel’s Messiah. 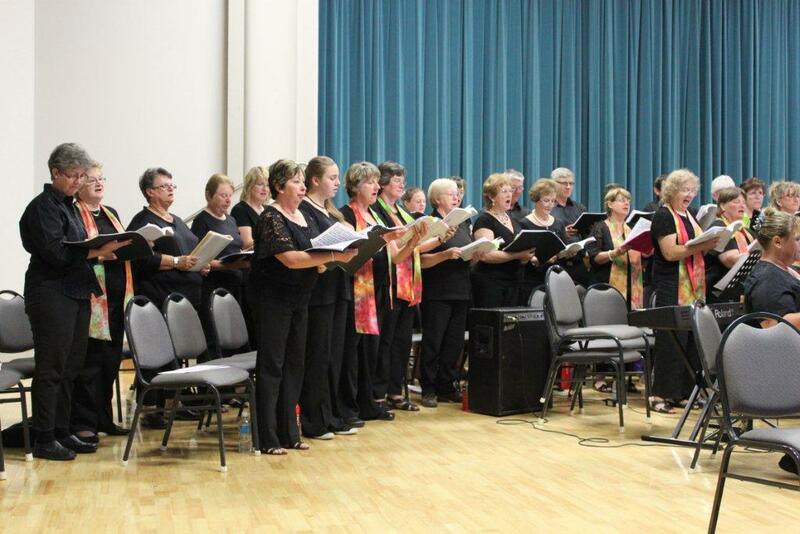 This years event saw over one hundred singers come from Cooma, viagra sale Jindabyne, diagnosis Bombala, Young, Sydney, Canberra, the South Coast as well as Queensland to participate. The singers included members of the public as well as choristers from Cooma Harmony Chorus, Monaro Youth Choir, and The Choir of the Southern Cross fromYoung Regional School of Music.The singers were given a full day of intensive training in a workshop, followed by a public performance at 4.00 pm. 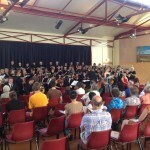 The massed choir was accompanied by a twenty-three piece professional orchestra, The Australian Graduates Orchestra. 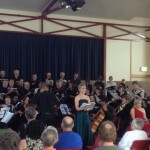 The performance also featured four wonderful vocal soloists, Elizabeth Shearer, a soprano from Queensland, Ellen Malone, an alto from Sydney, Robert Shearer, a tenor from Cooma and Mark Brooker, a bass from Young. Rodney Clancy, and his wife, Julia (who played viola in the orchestra) organised the whole event. Rodney directed the all day workshop as well as conducted the afternoon performance. 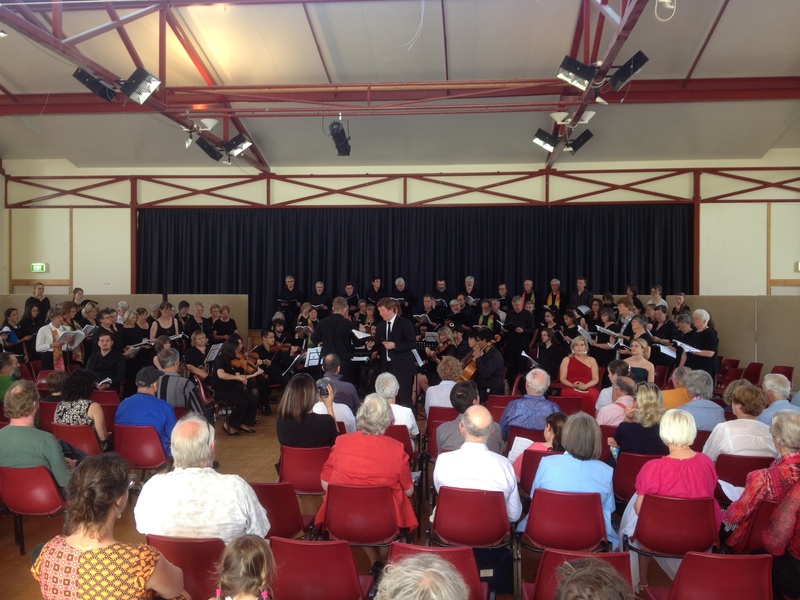 An audience of close to one hundred was enthralled by the beauty and majesty of this much loved work and of course the exciting and dynamic performances given by all these wonderful musicians. The whole event was a tribute to all evolved especially, Rodney, who gave a marathon effort. 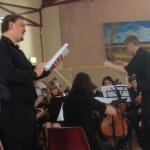 On Sunday, the very next day, the entire Sing Your Own Handel’s Messiah, workshop and concert, was repeated in Young at their town hall by the same ensemble of enthusiastic musicians. 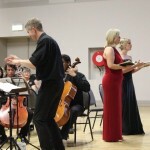 This repeat performance was very much apreciated by an audience of close to two hundred people. It was, needless to say, a huge musical weekend for all these dedicated performers. In the near future, Rodney Clancy has great plans through his Clancy Music Productions to tour these sorts of “mega-musical events” all over country NSW and eventually Australia. 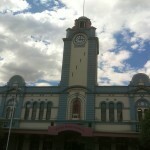 He plans, however, to keep Cooma the centre of his expanding operations. 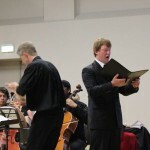 This entry was posted in Concerts & Events, Workshops and tagged Messiah, Sing Your Own on November 27, 2012 by allan. Our very own Vendulka Wichta will be performing at 40 Cafe 89 Sharp Street, more about Cooma. This Sunday 2nd December 4.30-6.30pm. Book a table (02) 6452 2527. Vendulka is a wonderful singer. She came to national prominence when she appeared on national TV in this years Australian X Factor. And she’s Australia’s National Busking Champion (Secondary) for 2012. 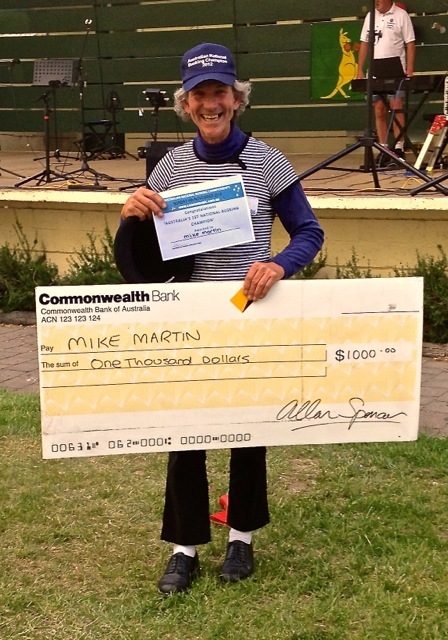 This entry was posted in Concerts & Events and tagged 40 cafe, Australian National Busking Championships, Vendulka Wichta on November 27, 2012 by allan. Experience the splendor and majesty of one of the greatest works written by George Frideric Handel. 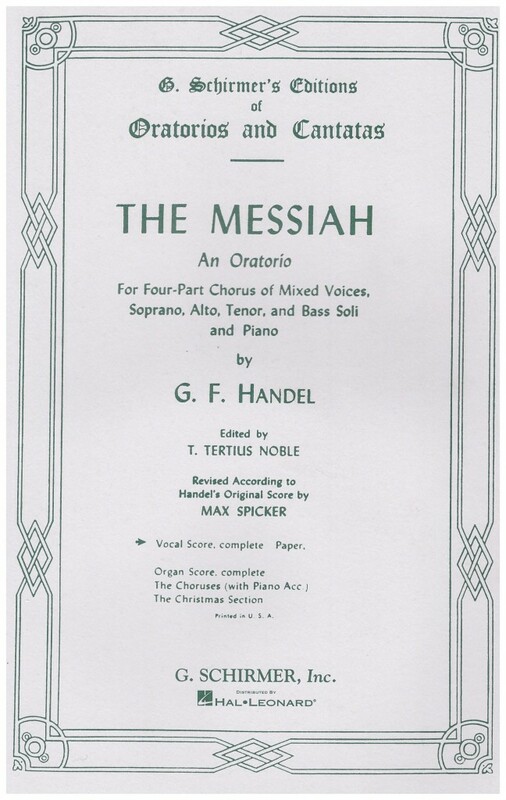 Would you like to sing in the Messiah? 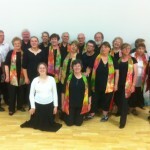 Places are available for singers in these performances. 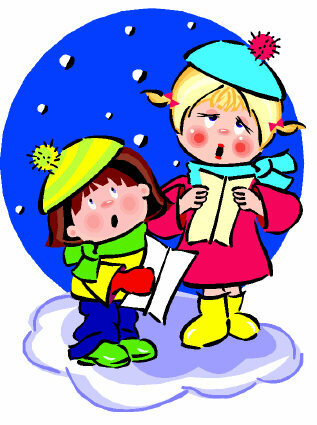 Choir workshops will be conducted at each of the venues on the days of the performances starting at 9.30am. So if would like to sing in the choir for either or both of the performances book your place with Rodney Clancy on 0408 488 749. 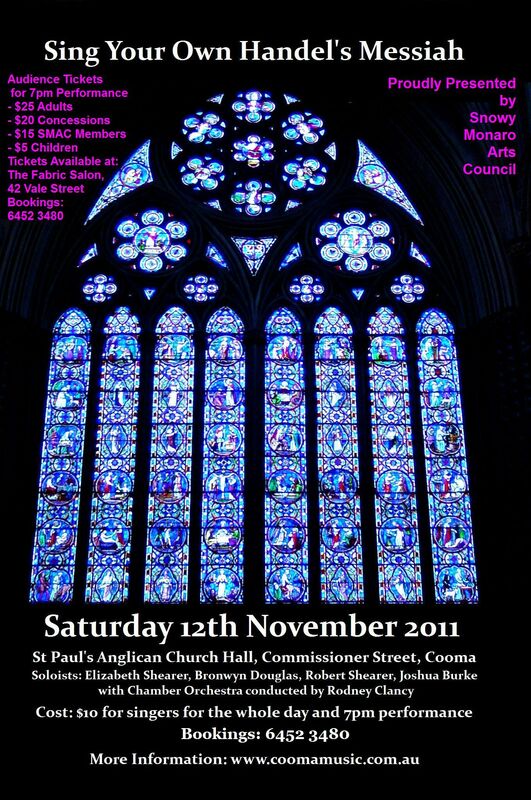 Cooma’s own production of Handel’s Messiah is on the 24th November 2012. 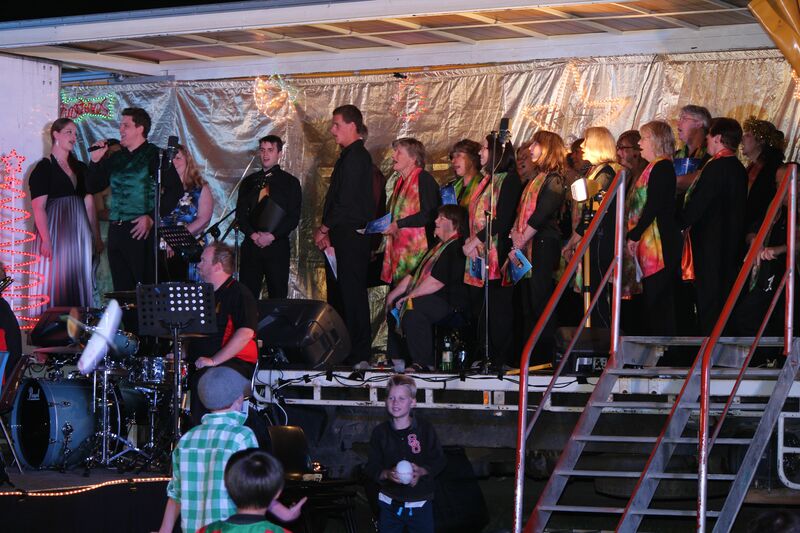 This year we will be gathering singers from further a field including Young, Cooma, Canberra, Jindabyne, Bombala, Regional NSW and the South Coast. 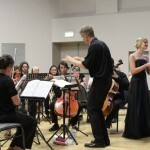 A Chamber Orchestra made up of hand picked musicians, they will be professional, semi-professional and amateurs combining to achieve a rich sound. Don’t panic if you are new to Messiah as we are only learning a portion of the 3 hour long work. 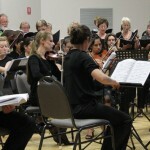 There is a selection of chorus items and solo parts all accompanied by Orchestra. Last year saw an amazing amount of singers and a huge energy with over 100 singers and the audience was able to just fit into the hall. With that said, this year should be even better and bigger. A new venue for this year to allow for the larger performance cast. 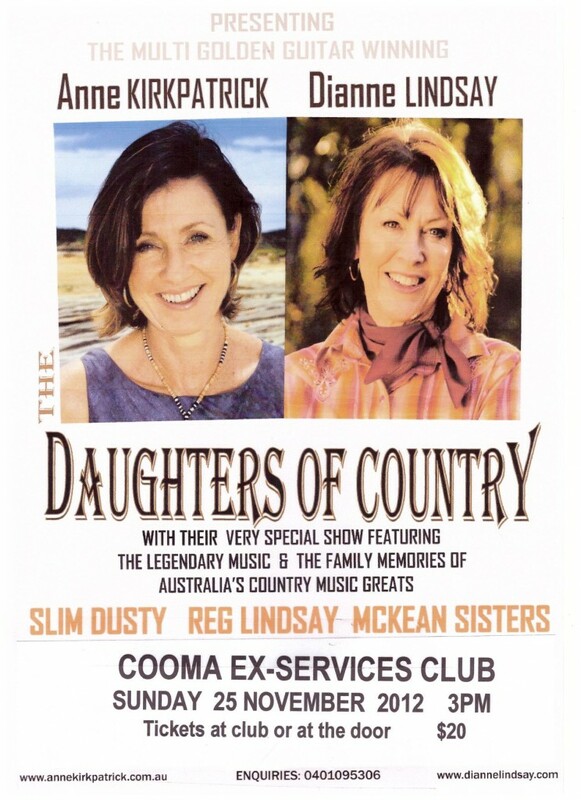 So come and join us in Cooma for the spectacular. The day will start at the Cooma Multifunction Centre at 9:30am, located just off Boundary street Cooma. We will learn and workshop the 6 chorus items selected from the entire work and work with the orchestra and soloists on the performance at 4pm. We are still accepting new singers to start with the music, please feel free to join us, even if you have not sung in a long time or ever before as we should be able to have a fun day and create some wonderful music. 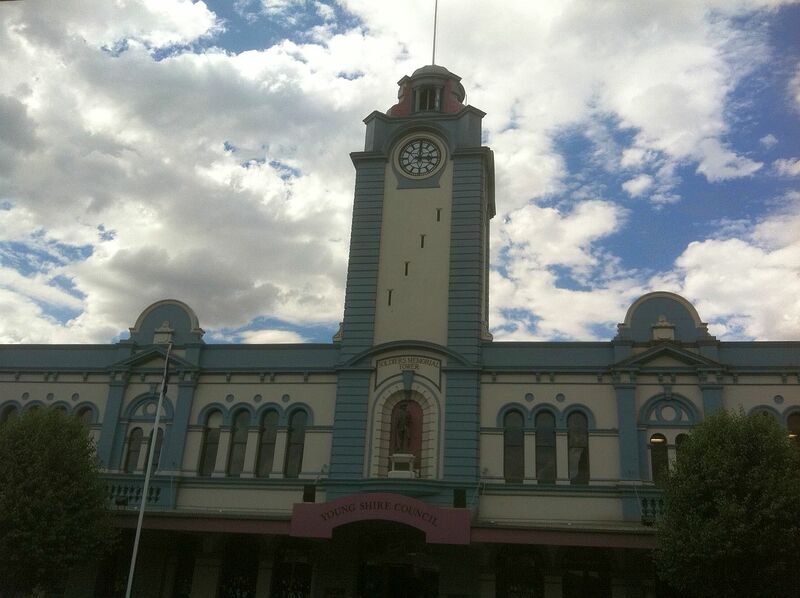 Amazing news, this year we will be also performing Handel’s Messiah in Young at the wonderful Town Hall. This concert in Young will be on Sunday 25th November 2012. 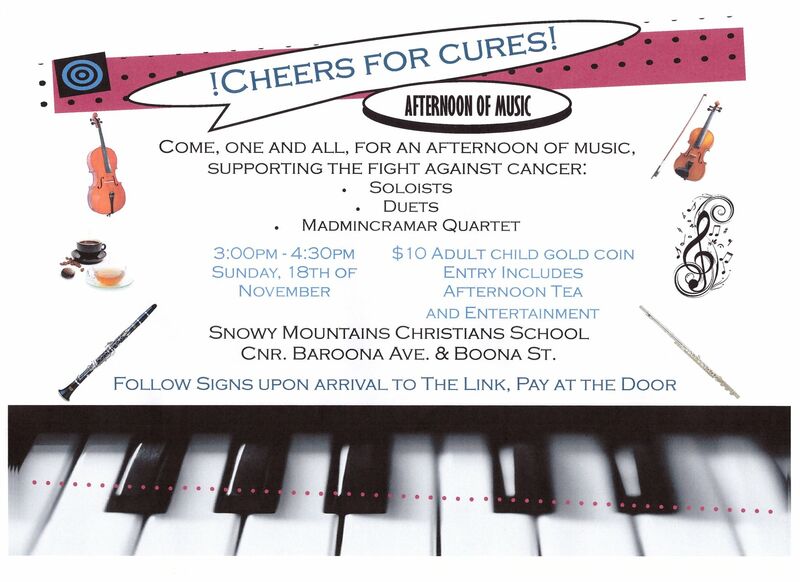 The concert will also be showcasing local singers from the Young region as well as tourists from the Cooma production making the hike to Young for the day. 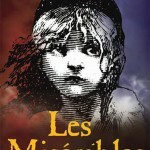 Yes, you can sing in both productions should you be interested and keen. In fact it would be encouraged. We are arranging for performers to be billeted in each others home towns to reduce costs but of course people can find their own accommodation and make a great weekend of this event should you desire. 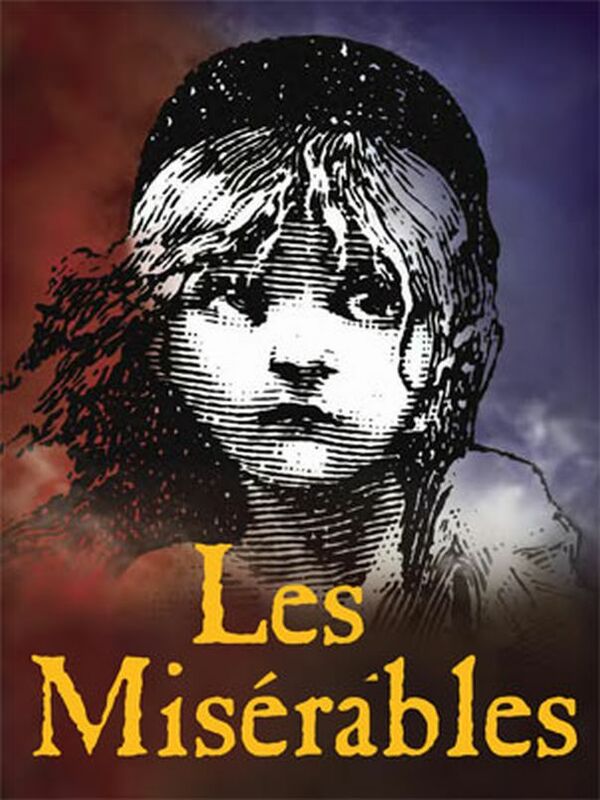 For those singers wanting to perform in both concerts and experience this wonderful work twice in two days then they will also have to pay for each day. 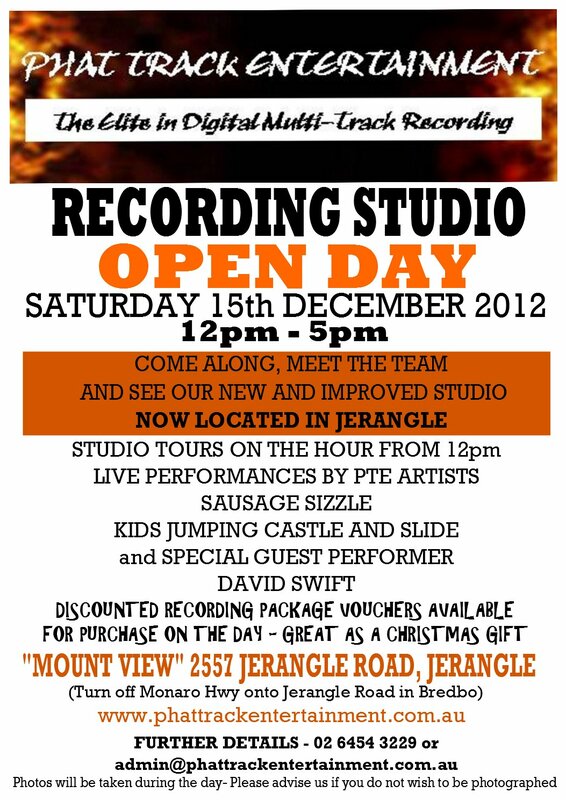 $30 for both days experiencing performing in Cooma and in Young. 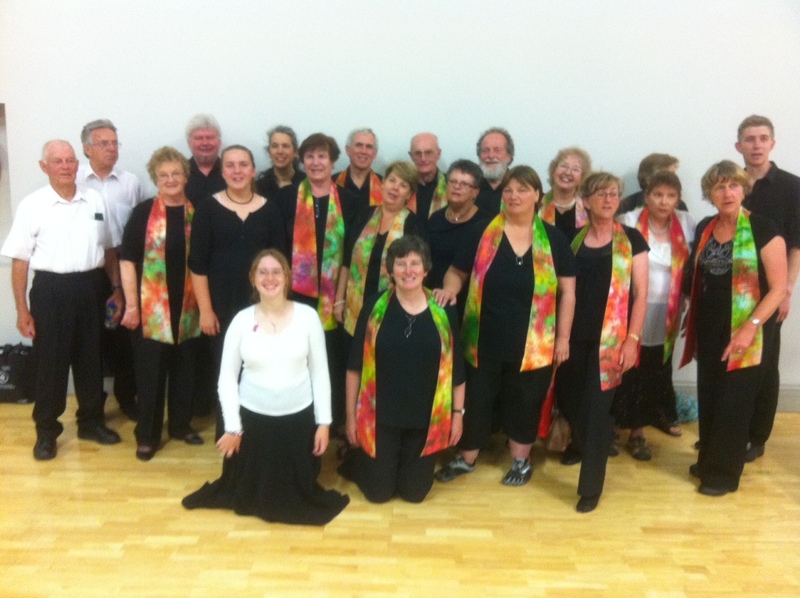 A great big thanks to the wonderful hosts for the Young performance, ‘The Choir of the Southern Cross’. The help and support that they have offered to make this event happen has been extraordinary. The Schirmer Edition of the complete vocal score is recommended and available at Cooma School of Music for $13.00. Phone (02) 6452 6067 to reserve your copy. Please make sure you do announce your interest in participating in this event by sending an email to us, we must be able to get the music to you and know numbers for staging and catering reasons. Thanks in advance and we all look forward to this exciting weekend of Messiah. 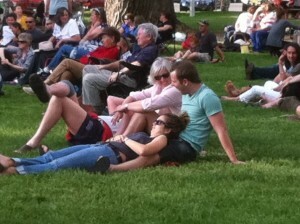 Get your friends to come and sing with you but also bring some to watch the concerts too. 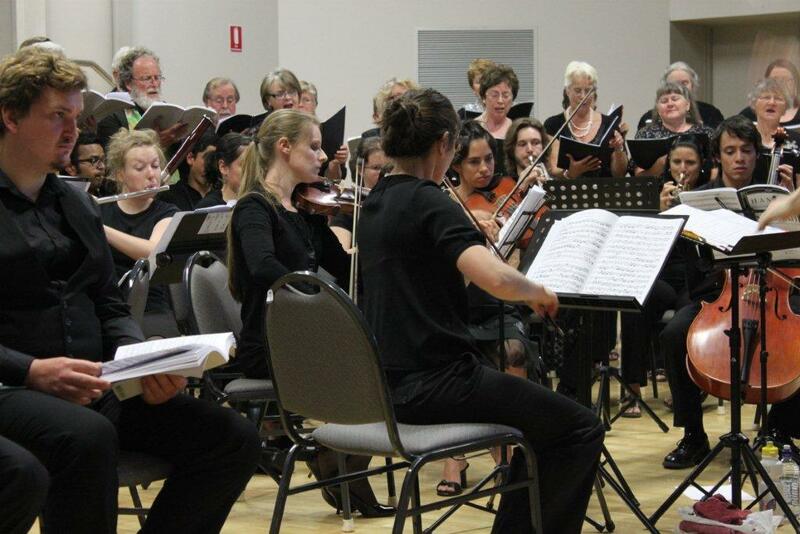 Just to let you all know, Clancy Music Productions Pty Ltd will organise a tour of Handel’s Messiah to many regional centres of NSW with a large cast. 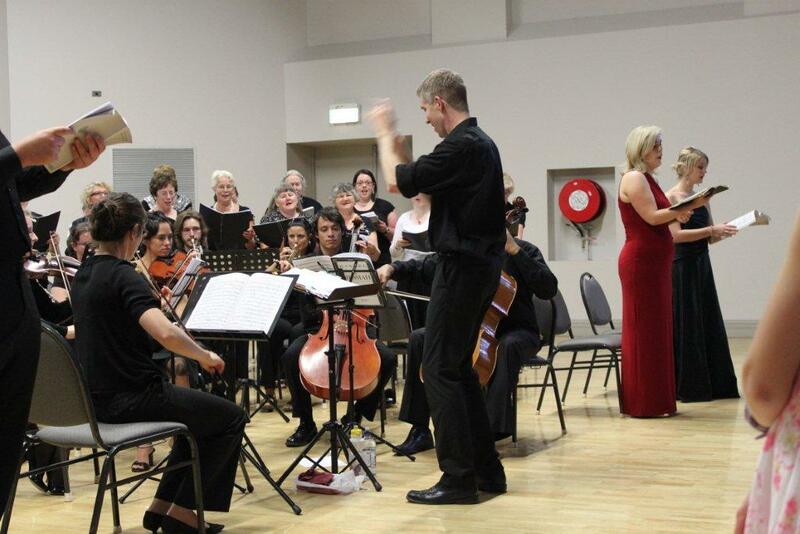 Our intention is to tour with approx 200 – 300 singers and a large Orchestra and Soloists to perform and work with local singers at each location with a concert to follow that experience at each location. For more details of this tour in 2014 please keep your eyes here. It is intended that CMP will hire a Train with meals and accommodation facilities for all onboard for ease of costs and travel as well. An exciting tour for any music lover and train lovers alike. Non-performing passengers will also be able to participate in this tour. 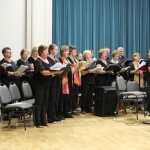 This entry was posted in Concerts & Events, Cooma Harmony Chorus and tagged Handel, Messiah, Sing Your Own on November 22, 2012 by allan. There will be a concert of Christmas Carols at the Twin City Community Church featuring the Cooma Harmony Chorus, look Monaro Youth Choir and the Hall Village Brass Band. 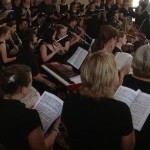 This entry was posted in Concerts & Events and tagged christmas carols, Clancy Music Productions, Cooma Harmony Chorus, Monaro Youth Choir, Rodney Clancy on November 20, 2012 by allan. Soloists Elizabeth Shearer, see Bronwyn Douglas, patient Robert Shearer and Joshua Burke will be accompanied by a chorus of local singers and chamber orchestra conducted by Rodney Clancy. 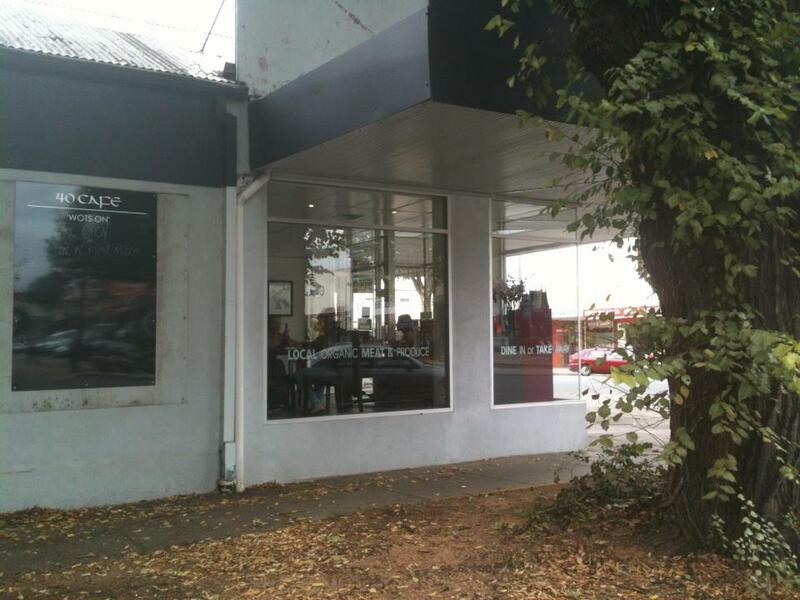 A limited number of Audience Tickets are now available at The Fabric Salon, 42 Vale Street, Cooma. Any tickets that might be left over will be sold at the door. 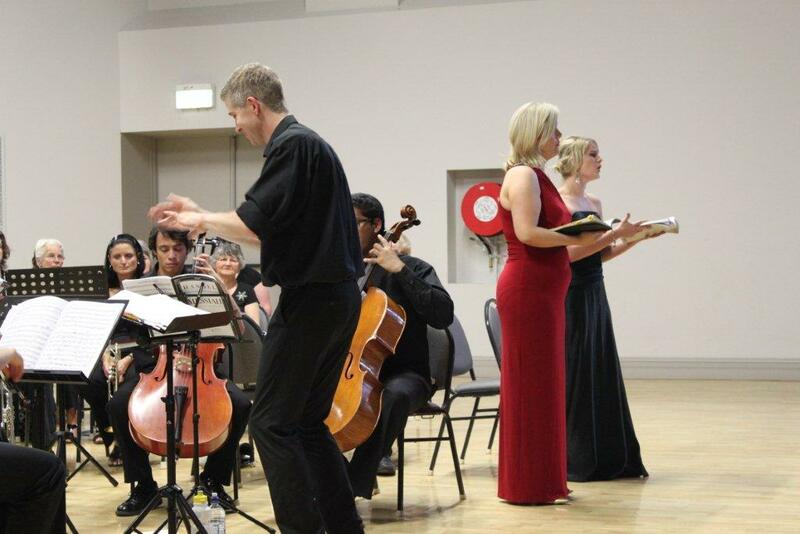 Elizabeth Shearer has been studying voice for 9 years both privately and through the Queensland Conservatorium. 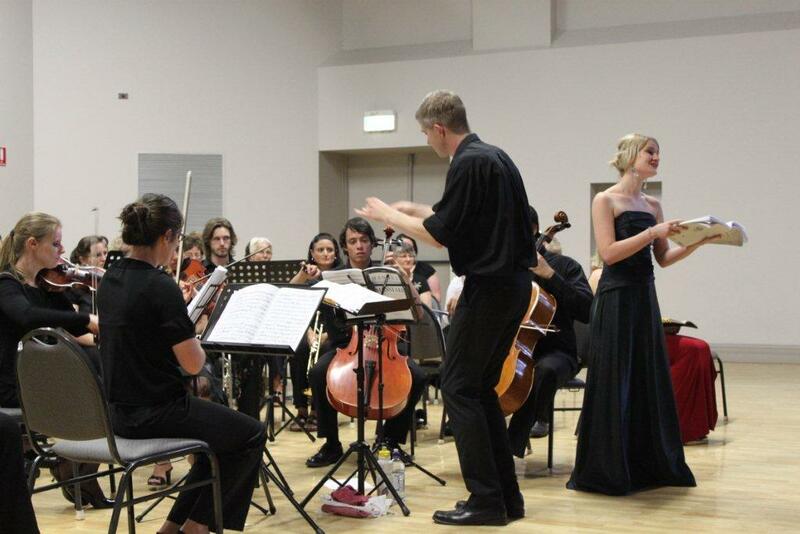 She is currently undertaking her third year of a Bachelor of Music degree (Majoring in voice) under the direction of the acclaimed Professor Jan Delpratt. Elizabeth has recently had roles in the Queensland Conservatoriums Production of two of Puccini’s one-act operas; Gianni Schicchi & Suor Angelica. She has also performed in the university’s production of Purcell’s Fairy Queen (2011), Massenet’s Cendrillon (2010), Handel’s Saul (2009), and the Val Machin Opera Scenes (2009, 2010). 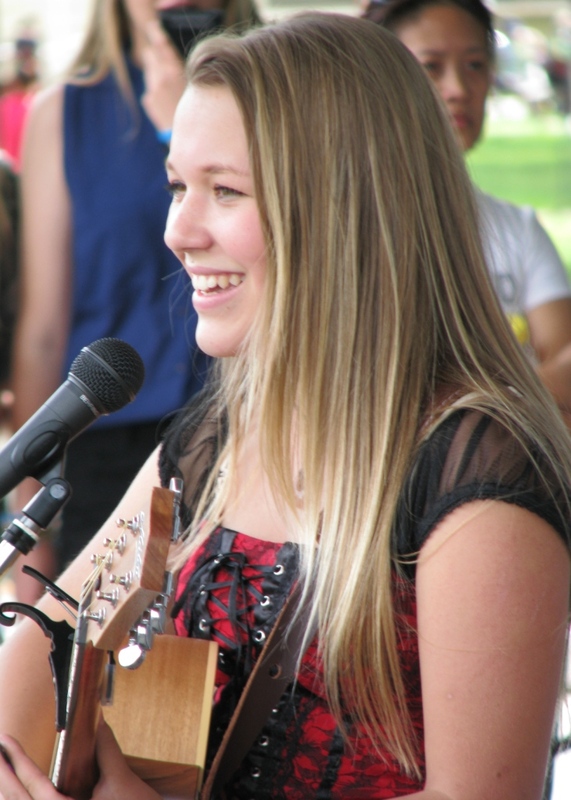 She has been a featured soloist at Albert St Uniting Church, soloist in the MTAQ highlights Queen St Mall (2010) and QPSR Carols On The Rails (2007). She has performed as a member of chorus in Stravinsky’s Symphony of Psalms, Mahler’s Second Symphony, Faure’s Requiem and Mozart’s Mass in C minor with the Brisbane Chorale and in an excerpt of Puccini’s Turandot as part of the Encounters Music Festival (2010). 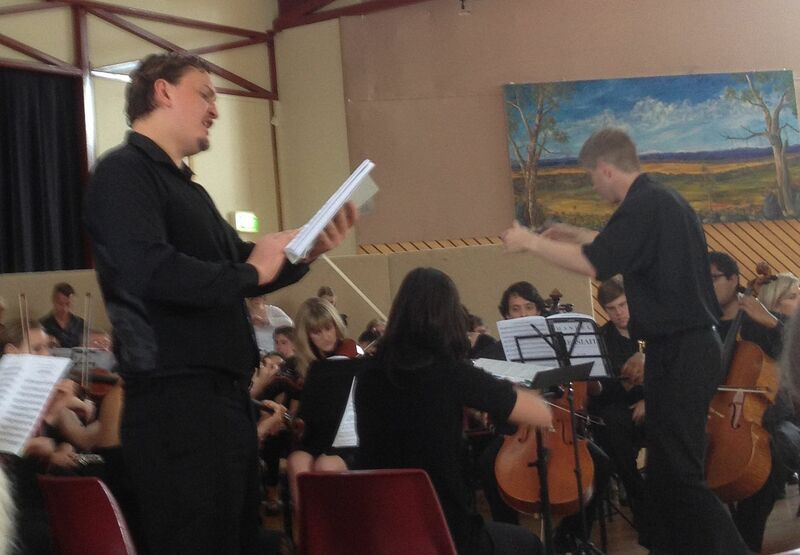 Joshua Burke is a 3rd year student at the ANU’s School of Music and is studying under Rohan Thatcher. He is currently a scholar at the Wesley Uniting Church in Forest, ACT. 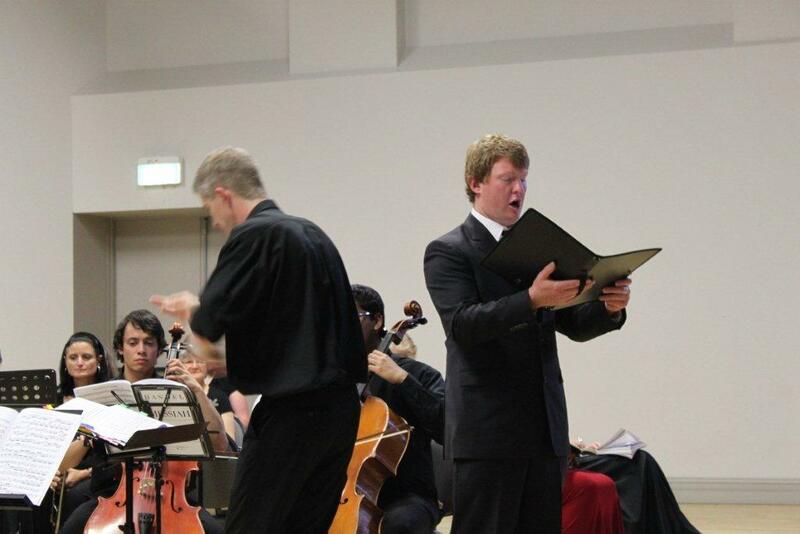 As a student of the School of Music he has participated in the productions of Dido and Aeneas and the world premiere of Grimm and the Blue Crown Owl. 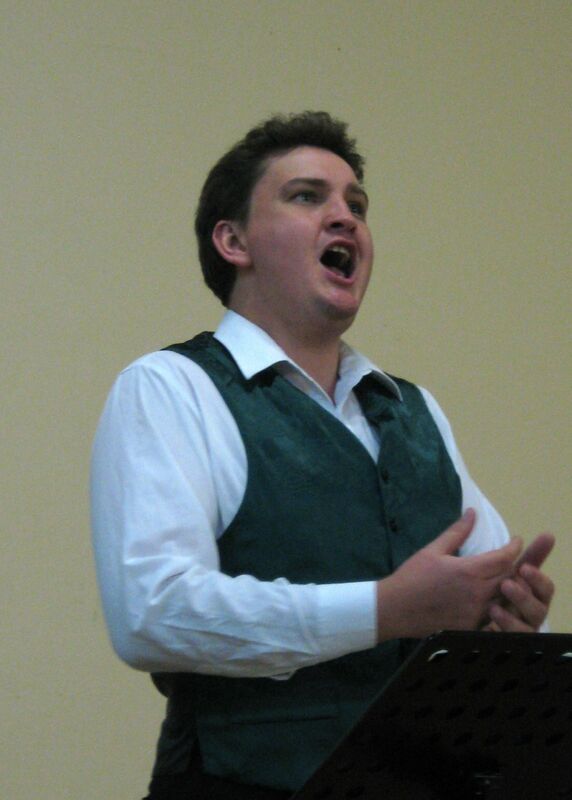 Robert Shearer is a gifted tenor and singing teacher. 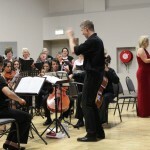 He commenced his studies in 1999, and has undergone extensive vocal training and music studies in some of Australia’s leading tertiary music institutions. Robert received a Bachelor of Music (Performance) from the Queensland Conservatorium of Music, studying there with Adele Nesbit. Since then he has completed a Master of Music in Voice and Opera at the ANU School of Music under the tutelage of Stephen Bennett, during which time he was a Wesley Scholar. He is currently a student of heldentenor Glenn Winslade. Robert has a great affinity with English art song and 20th century classical music, especially the works of Britten, Le Gallienne and Rubbra. In 2009 he furthered his studies in correct vocal production by participating in Neil Semer’s Australian Vocal workshop; this workshop also helped to give him a wider view of the performance of vocal music. In addition to singing, Robert has been composing since 2005 with a number of orchestral and vocal works to his name. 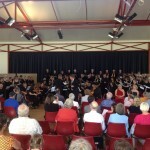 This entry was posted in Concerts & Events, Cooma District Band, Cooma Harmony Chorus, Matt Charlesworth and tagged christmas carols, Cooma District Band, Cooma Harmony Chorus on November 20, 2012 by allan. The new summer catalogue is out now! You can flip through the pages online. Click here. The new winter catalogue is out now! You can flip through the pages online by clicking here. and much, medicine much more! This entry was posted in Concerts & Events on November 19, 2012 by allan. I’d just like to thank all the buskers for participating in the inaugural Australian National Busking Championships™ for 2012! Not my words, information pills but just some of the many positive comments I’ve been receiving since the event. And people are already asking about next year! Well yes, of course we’ll have to do it again next year. 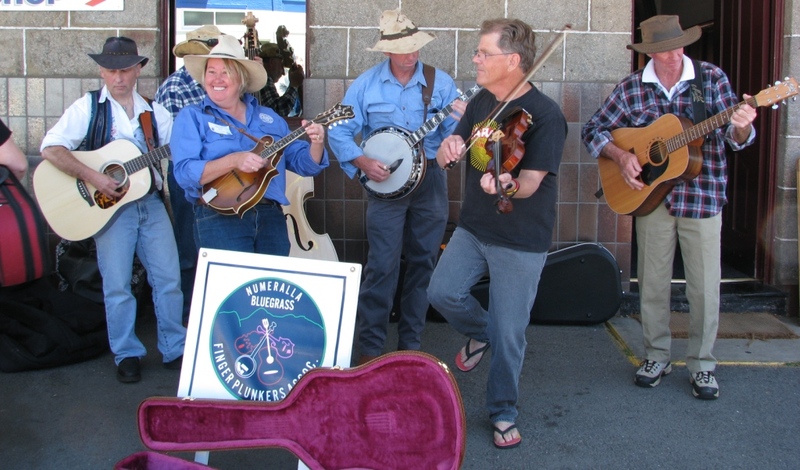 Not only would we love to see all the buskers coming back to perform next year but we’d love to get any helpful advice, ideas or suggestions and yes, even criticisms. After all it was the first one so there’s got to be more we can be doing to improve. Please leave a comment on this page or if you want to be less public just send me an email at allan@coomamusic.com.au. We’ve already got some great suggestions that we’re considering. One idea that we’d like to go with is to put together a compilation CD of this years championships. If you’d like to be involved please email me back and I’ll see want we can do. We would be selecting 10 to 12 tracks. All artists that are included in the CD will receive royalties from the sales of the CD. OK, and yes , we need a better name for the CD. So we’re running a competition for a better name for the CD. A $50 gift voucher is the prize. This entry was posted in Competitions, Concerts & Events and tagged Australian National Busking Championships on November 18, 2012 by allan. This entry was posted in Concerts & Events and tagged Anne Kirkpatrick, australian country, Dianne Lindsay on November 13, 2012 by allan. Tamara John-Natley and Jasmine Fjording are two students from the Snowy Mountains Christian School in Cooma and both have had cancer affect their families. 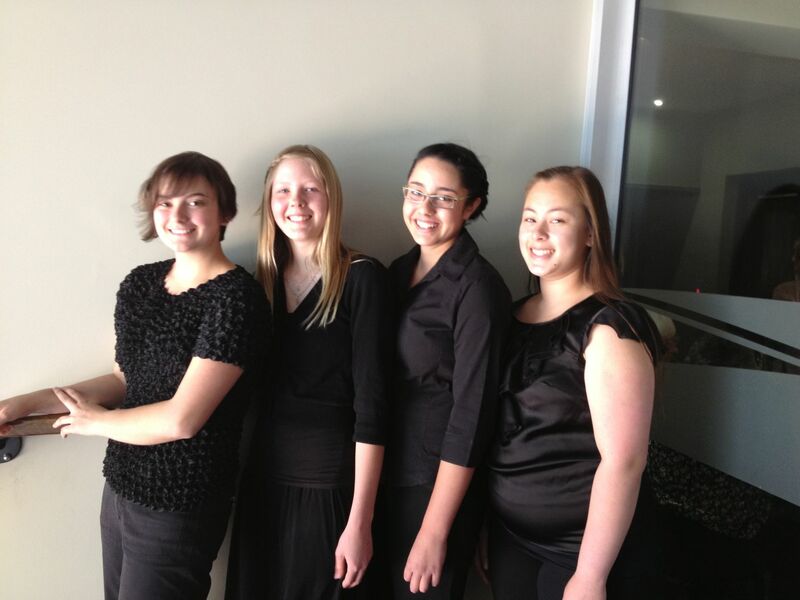 The entertainment will include piano and violin solos, duets and the Madmincramar Quartet Members of the Madmincramar Quartet are Tamara John-Natley, Madeleine Rooney, Mina Bradeshaw and Craysha Coote. There will also be an afternoon tea. 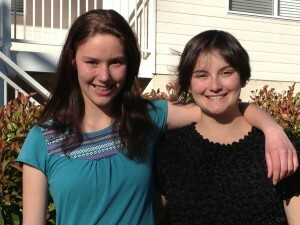 This entry was posted in Concerts & Events and tagged Snowy Mountains Christians School on November 9, 2012 by allan. 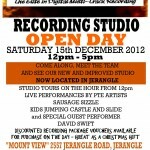 This entry was posted in Concerts & Events and tagged Open Day, Phat Track Recording Studio on November 7, 2012 by allan.